Sun Peaks Bike Park - Great Bike Trails For All! The Sun Peaks bike park, rated as the 9th best bike park in the world, provides further proof that what goes up 2,000 vertical feet of lift accessed bike trails, is even more awesome to come down. Save up to 30% on your lift-accessed hiking pass - buy online and in advance via the Liftopia link on the left of your screen. 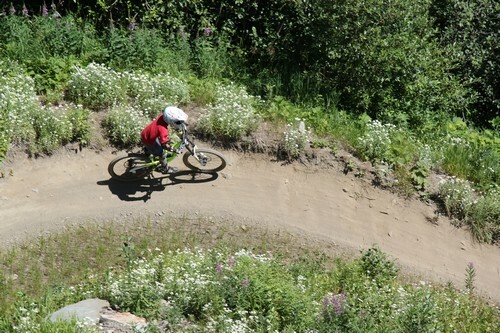 With quality summer bike rentals, lessons and over 40 machine or man-made trails for all levels and ages of bikers, from young or beginners to adrenalin-fuelled experts, Sun Peaks is a must do for summer biking fun! If downhill biking is not quite for you (yet) or someone in your group, there are plenty of excellent cross-country ‘free-to-ride’ or lift accessed trails as well. Taking the number of trails, total vertical, value for your biking holiday buck, and overall reputation and biker satisfaction into account, Sun Peaks bike park has been ranked as one of the Top 5 bike parks in North America by Bike Magazine, and 9th best in the world by WorldBikepark.com. Paul's first-ever bike park trail - and he loved the new green top-to-bottom trail! True it’s not Whistler/Blackcomb (the #1 bike park in the world) and that’s why we love it so much! 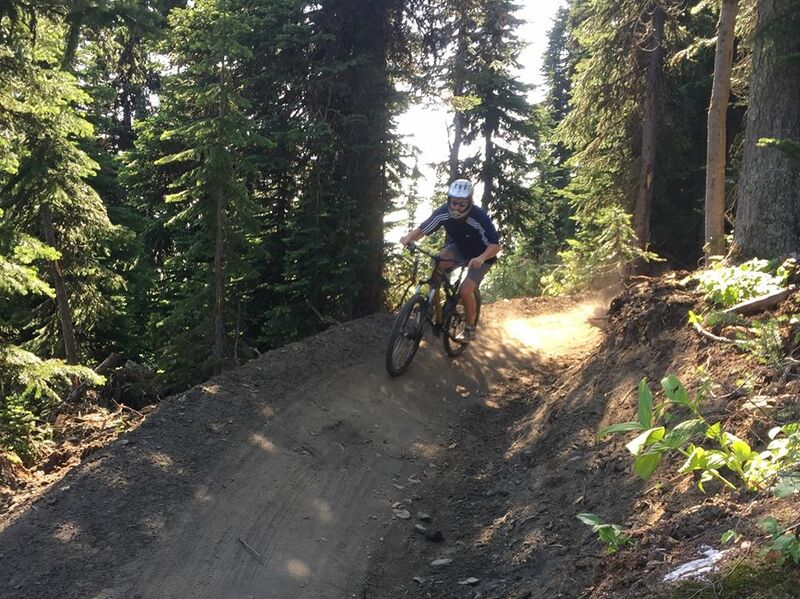 And with the introduction of several new Sun Peaks summer bike camps taught by local pro-mountain bike athlete Dylan Sherrard, you can learn to ride and trails and shred the Sun Peaks Bike Park like a pro. Sun Peaks also offers a number of other tours and bike lessons - click for more Sun Peaks Bike Camps and Programs. The Sun Peaks Bike Park is a constant work-in-progress, with improvements happening each season. Not only did the summer of 2018 bring improvements to popular trails like Smooth Smoothie and Route 66 to provide better top to bottom options for riders. In addition, a new green trail was added at the top of the Sunburst chairlift, that takes riders 9km along winding trails and through alpine meadows, where it meets up with the end of the lift-access alpine XC trail Altitude. I tried this new run in July of 2018 shortly after it opened, and it was not only my first-ever bike park trail, it was AWESOME. I am in my 50's and not your typical bike park type. But I can see why bikers love these trails. I can't wait to get my armor/protective gear for the next time and to work on improving my skills. 2018 also introduced a new skills park located near the Sun Peaks Go Kart track. You need a pass to use it, and it uses a magic carpet to take you up to the top, where you can then ride down and practice your moves on the newly cut Sun Peaks Bike Park trails. Downhill Sun Peaks Bike Park or cross-country – which is the best trail and why? Try them all and let us know! Need other suggestions for a Best Sun Peaks Vacation? 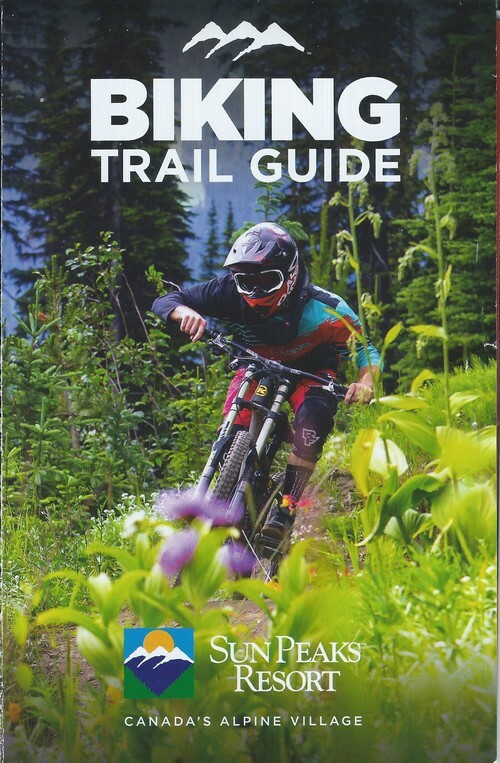 Pick up a free Bike Park map at the Tourism office, in most Sun Peaks hotel lobbies, or in our Best Sun Peaks condo or Trapper's Landing townhouse if you are one of our guests. New Run 2018 (not named yet) - Now considered the easiest green trail, from the top of the Sunburst chairlift, 9km down where it meets the end of the Altitude trail and takes you right down to the village. Lots of berms and switchbacks - watch for deer on the trails! Smooth Smoothie - One of the easiest trails in the Bike Park. This is a wide and gentle trail to start on that has switch backs all the way down the mountain. Lever Lovers - This trail is very similar to Smooth Smoothie, but with more technical sections. Road 04 - This wide dirt road is used for trail connection. This road is shared with service vehicles so please use caution. Lower Shortcut - This access road intersects with Kaboom and Honey Drop, offering an easy out if you're feeling tired. 5 Mile Road - This is a wide dirt road used for trail connection. Please be aware of service vehicles on this road. Big Rock Ride (XC) - Choose your own adventure on this fun cross country trail, leading riders along great singletrack through vibrant wild flowers, sub-alpine forest and wide open meadows with fantastic mountain views. Gummy Bear - A winding single track trail that has roots, rocks, short uphills, and short steep descents that will develop your skills as a mountain biker. Mach Novice - A great single track trail to step up your riding, and learn how to ride steep sections. Barn Burner - This intermediate machine made trail has lots of berms with a step up, step down, and some steep sections. Be sure to pin it on the last berm which is over six feet tall. Ain't No Scrubs - A rowdy machine made trail loaded with hits. Trail speed will send you over tables, doubles and step-ups with no pedaling required. Way Out - This new trail offers an alternate route off Smooth Smoothie around the section of Ridge ski run with huge, steep, beautifully transitioning berms. Route 66 - This flowing machine made trail is filled with berms, and is suitable for a wide variety of abilities. Spicy Taco - Hang right off of lower Barn Burner for a relatively steep descent into some fun, technical single track through the trees and down to 5 Mile Road. Root Dog - Root Dog is a narrow, low grade, technical trail through the trees featuring a ton of roots. Holy Rollers - Pin it down this super fast and flowing trail with plenty of rollers and a couple small creek gaps. Home Run - An intermediate machine made trail suitable for a wide range of ability levels, featuring small hits and rollers down Homesteader ski run. Wagon Wheel - A fun, low grade, intermediate machine-made trail off of 5 Mile Road with transitioning berms and tons of optional jumps to get sideways on. Zazel Track - A fun single track trail with sections that require pedaling. This is an excellent trail to access the upper end of the village. Sugar - Low grade technical singletrack with short steep sections, roots, and plenty of wood. An epic ride paired with Sweet One. Cat Trax - A reasonably technical trail through the trees featuring a rock garden and tons of roots. Kaboom - Technical single track, rock faces, drops, and steep loose shale sections. DH - This Sun Peaks Bike Park trail begins with a full throttle descent with moderate rock drops. The trail then becomes single track. The final section of the trail is fast and flowing berms. Hi-Octane - Hi Octane is a braid of trail that can be accessed from DH or Barn Burner. This trail is single track all the way. Repeat Offender - This machine made free-ride trail is packed with relatively large doubles and big ol' berms to keep your speed up for hit after hit. Steam Shovel - This is signature machine made trail at Sun Peaks for those who like to send it, and don't want to pedal. This trail features jumps, tables, and two rock faces. Behind Bars - Behind Bars features roots, intermediate wood work, and tons of cornering. Keener - A short, straight, and fast single track trail that connects Gnar-Boom to Steam Shovel. Biker Cross Course - The biker cross course features step ups, doubles, tables, a hip, and berm after berm. Arm Pump - Fun single track that rides really fast and flowy with a few technical sections that will test your bike handling skills. Insanity One - Insanity One is the most technical trail on the mountain with extremely steep sections. Just dropping into this trail takes some balls. Honey Drop - Technical single track with loose dirt and drops. Definitely one of the hardest trails at Sun Peaks. Are you up for it? Creeper - This section drops off Steam Shovel and reconnects later down on the run. Creeper is a super technical single track trail side cut into the mountain. Gnar-Boom - Even gnarlier technical single track, rock faces, drops, and steep loose shale sections. Definitely not for the faint of heart or for me! Smitty’s Steeps - As the name implies, this trail is steep fall line shredding! Sweet One - Singletrack loaded with wooden jumps and bridges over creeks. Look before you leap, it'll take you a few laps to master. Flow Zone Dirt Jump Park -The Flow Zone features doubles, step ups, and tables for intermediate to advanced riders. It is located right under the chairlift for your viewing pleasure. Downhill Sun Peaks Bike Park or cross-country mountain biking? Either way head up the hill and enjoy the natural beauty and friendly nature of Sun Peaks Resort this summer.